The big blue wave suffered from too long in storage and was acting up like crazy when first brought out of hibernation. Well, after a lot of prodding and cleaning she sings again! I put it down to the silver contacts on the large DIN interconnects between all the boards and the PSU et al. What does silver do when left for ages, tarnishes of course and tarnation, that darn tarnish don't conduct the ol' electrickery like it s'possta. I've always been fascinated by the quirky sound of the Wave series of synths since listening to 'Exit' by Tangerine Dream. So strong was this that I ended up with one of my own! My Wave system comprising of Wave 2.3 and Waveterm B was previously owned by 'Endgames according to the flight case, though it may just have been that it sort of fitted the box! It was a trade for a Polyfusion modular system. (from one reliability nightmare to another!) Much as I love modulars, and I was mad to part with it, I never really felt at home with the 'fusion, partly due to it not working initially and also that it was just too 'brutal' sounding for my liking. 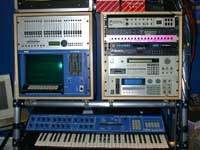 Both the Polyfusion and the PPG were acquired via the renowned Bob Williams (Analogue Systems), the Modular was then alleged to go on to Hans Zimmer no less! (please correct me if I'm wrong Bob!) If anyone has any pictures of the group Endgames with a PPG, please let me know. One of the bands members, David Rudden has a Myspace page (if it still works, otherwise check out Youtube) with a few of their tracks so if you haven't heard them before, do check them out! My 2.3 and Waveterm are some of the main signature instruments in the studio. Having acquired these beasts through the previously mentioned trade for the Polyfusion Modular system, little did I know what I'd just let myself in for! Sounds were the real draw for me with the PPG, so my initial reactions were of slight disappointment somewhat by the mediocre patches left in the 2.3. Thankfully there were enough of my favourite vocal effects, table sweeps and 'thunks' to spur me on to delving deeper into programming more of my own. The wave series are a slightly unpredictable breed when it comes to sounds, with their own brand of random patch creation. This comes about due to the sampling of the potentiometer settings. When you call up a patch, the knob positions don't necessarily correspond to the actual levels of those parameters, and if a pot' is slightly 'noisy' or you nudge it (read sneeze, blink etc...), it will suddenly jump to the physical setting and hey presto, totally new sound. This 'feature' is both a boon and a headache, depending on whether you were just about to have fine tuned 'that' killer sound you'd been tweaking for the last hour, or were just doodling about!